There are nearly one million Indigenous People in Canada. First Nations are the largest Indigenous group in Canada, comprising more than 600,000 people. The term First Nations represents the first peoples of Canada, and their descendants, who are neither Inuit, nor Métis. First Nations includes many culturally diverse groups living across Canada. For example: There are 11 First Nations linguistic families, including 53-70 languages. The term First Nation has been adopted to replace words such as Indian, Native, Tribe, and Band, which are still commonly used by federal, provincial, and territorial governments. First Nations people and First Nations communities often use the name of their Nation to describe who they are. For example: Dakota, Dene, Ojibwa (Anishinnabe). Métis are a distinct cultural group composed of people of mixed Indigenous and European ancestry. In the 2001 Census, 292,000 people identified themselves as Métis. Although the Métis are recognized as one of the three Indigenous peoples of Canada, most Métis people use the word Métis to define themselves and not Aboriginal. Métis are excluded from registration under the Indian Act. With the exception of the Métis of the Alberta Métis settlements, there are no formal ways of registering the Métis . In Canada, Inuit is a general term used to identify a group of Indigenous Peoples who live primarily in Nunavut, the Northwest Territories, Yukon, and northern parts of Labrador and Quebec. There are approximately 45,000 Canadian Inuit, and they share a common language and similar culture. Like the Métis , the Inuit are excluded from registration under the Indian Act. Only Indigenous Peoples who are registered under the Indian Act receive treaty benefits, meaning that neither Métis nor Inuit qualify. Canadian natives do have a flag, I've rarely seen fly - there is an example in the window of the Army surplus store (FS as merchandise) and once on a news report from a native reserve - it is the usual Canadian flag with the image of a native man/chief/warrior (I'm not sure, I'm not native, so I don't know what he is supposed to be) superimposed on the flag. If I remember correctly this flag is hoisted with several patterns. I made a drawing some years ago from a flag seen in photo or TV with the Indian Saskatchewan figure but I believe that other figures are also used. 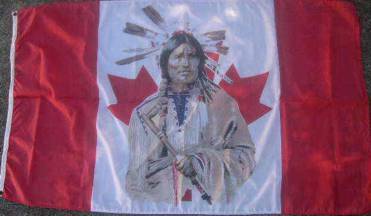 The image is very simple: Canadian flag with a head of a Indian chief in white part. 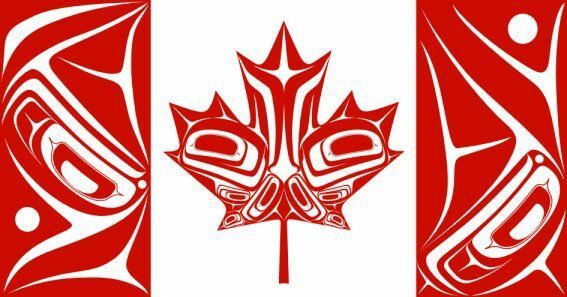 This flag was designed by an Kwakwaka'wakw artist named Curtis Wilson on Vancouver Island. The design is said to represent all the First Nations of Canada. It is a brand new design and only time will tell, for there is already a flag representing all the First Nations peoples of Canada (although little used). It has the Canadian vertical red-white-red bar design and is defaced with an Indian chief in feather headdress in the middle, which replaces the maple leaf. More commonly, however, many of the tribes simply use their own individual tribal flags. 2-Spirited People of the 1st Nations is a social services organization of First Nations LGBT people in Toronto. 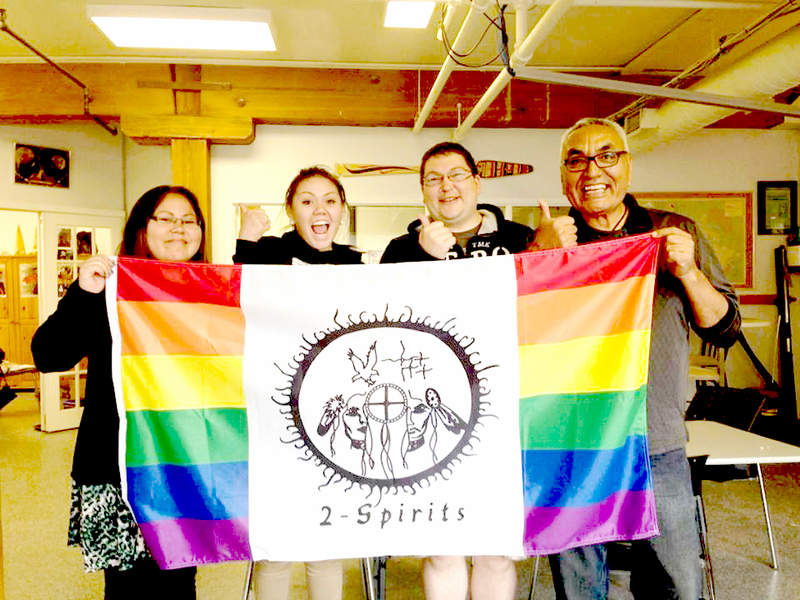 Name "two-spirited" for the LGBT people comes from the belief that such people have both male and female spirits, unlike the straight people, whose only spirit corresponds to their physiological gender. The flag of the organization is derived from the Canadian Pride Flag, by replacing the red maple leaf with the organization's logo drawn in black. Central element of the logo are two incompletely visible human faces, partly hidden by a medicine wheel placed between them; one of faces could be female and the other could be male, but it cannot be precisely told (which was probably intended). Inscription 2-spirits is placed beneath the logo. The photo of the flag dating from 2014-05-29 can be found at http://www.2spirits.com/images/2%20spirts%20new%20flag.jpg and https://www.facebook.com/2spiritsTO/photos/pb.1376548885962142.-2207520000.1409161676./1417404441876586/?type=3&theater. The earliest photo of the flag is dating from 2005-06-02 at http://www.2spirits.com/FlagRaising2005.html (Image: http://www.2spirits.com/images/Arts%20Flag.JPG). Prior to 2005, a different flag was used, derived from the gay rainbow flag by adding a large disc quartered black (top hoist), white (top fly), red (bottom hoist) and yellow (bottom fly), with a black fimbriation all around. These colors represent the four cardinal directions in many North American indigenous cultures. The photo of this flag, dating from 2004, can be found at http://www.2spirits.com/2%20Spirits%20Celebrate%20Pride%202004.html (Image: http://www.2spirits.com/images/pride2004/2spiritscelebratingpride20048.JPG). FNTC is a First Nation public institution whose primary responsibilities include ensuring the First Nations property tax system is administratively efficient, harmonized, improves economic growth, and is responsive to on-reserve taxpayers.